For Sapporo, a city covered in snow for one third of the year, March is the season where the spring sunlight finally arrives and we welcome the thawing of snow. While there are those who glad to hear of the arrival of spring, this is most likely not welcome news for those who love winter. Rather than having their spirits raised by seeing the budding trees, there are those who see the thawing snow and think with disappointment, “Ah, winter is over in a flash.” That’s because there are so many entertaining things that can be done around Sapporo during this cold season. For example, you have winter sports and the onsen (open-air baths are desirable), winter-specific seafood (such as crab), and the world famous Sapporo Snow Festival. Of course, it is too bad that you have to wait until the next winter comes to enjoy these things, but it is too early to get down about it yet. Luckily, you can enjoy skiing in Sapporo until the beginning of May. Let me introduce a ski resort that I frequent, the Sapporo Teine Ski Resort, which is approximately 40 minutes from the city center by car or 16 minutes from Teine Station. At this ski resort, there are several courses with different degrees of difficulty for beginner, intermediate, and advanced skiers . There are many beginner runs for novices to go at their own pace. Among them, the Natural course, which starts at the summit of Mt. Teine at 1,023m, is particularly fun. This long, forested trail spans approximately 4,000m and allows you to get close to nature. It is also a safe slope for those bringing along children. The view of mountains, valleys, and the ocean which you see as you descend down the slope is very impressive. Those who’ve graduated from beginner level or those who want to challenge themselves a bit more should definitely try the City View Cruise run. 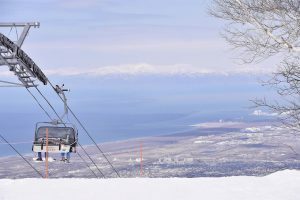 This course, which offers a view of the city, is a unique and thrilling feature of Teine Ski Resort, conveniently located near Sapporo. Those who are confident in skiing probably look for steeper slopes. At Highland, there is the Kitakabe run, which is a rare, wild course which runs through the trees. You can enjoy this black diamond course with natural moguls and deep power snow. If you prefer smooth black diamond slopes to those which have many moguls, the Women’s Giant Slalom, used during the 1972 Sapporo Winter Olympic Games, is interesting. If you think of the Olympic athletes who fought for gold medals here in 1972 as you ski, you may be overcome with exhilaration and a sense of accomplishment as well. Skiing or snowboarding down these runs in the spring season when it is warmer and the daylight hours are longer has a different appeal than that of winter. 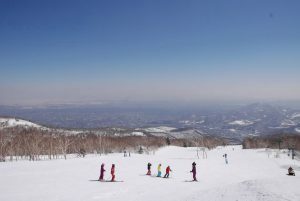 There is still time before the ski resorts close for the summer, so come to Sapporo’s ski resorts while you still can!